This spring I was one of the speakers at a state beekeeping conference focused on planting natives for bees. It’s hard to cover the topic without discussing the fundamentals of gardening, especially the need for good healthy soil. 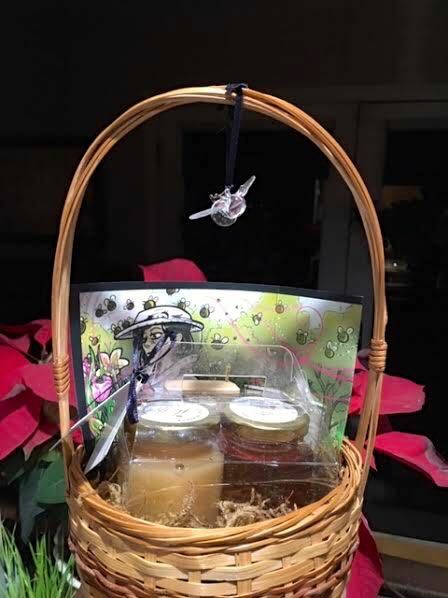 Knowing the conference would have a silent auction, I quickly made up this personalized gardening starter kit with an excellent Fundamentals of Gardening book; handmade gardening soap; gardening claws and, for a special treat, a little jar of honey that took bees visiting 100,000 flowers to make. In addition, I shared seeds from two of my favorite plants, Cushaw pumpkins, the native North American pumpkin that most likely was at the first Thanksgiving, as well as zinnias. The zinnias are not native but they are so easy to grow and provide wonderful pollen and nectar for a variety of pollinators. For a beginning gardener, zinnias are a guaranteed win. Alice, the silent auction winner, came up to me at the end of the conference to tell me how delighted she was with her gardening starter kit. Her son had squirreled away her yard sale gardening book so she bid on the starter kit for the book. Her family, however, is excited about the gardening claws. Her husband wants to scratch the dog with the claws and another family member thinks they would be excellent for a Halloween costume. So glad to hear they have found many other handy uses for the gardening claws! I warned Alice the soap will last a long time so not to be thrown off by the small size. She said she will be happy to have something handy as soon as she gets in from the garden and ,in terms of the honey, she has very specific plans for that and they don’t involve sharing. Enjoy your gardening starter kit, Alice and let me know how the seeds do in your garden! One of the easiest ways to personalize a gift is to add a name. In the case of Bluebird Gardens-made items, we add our signature patented logo label with a ladybug on the back of our items. The quilts are shipped with a care guide and certificate of authenticity, which gives our customers an extra assurance that they know the original source of their items. Periodically someone asks us how to personalize a gift without them having a pre-printed label. That’s easy, have a local embroidery shop embroider a name and special date on fabric you can then make into a label. Last week, we helped a customer making her own first quilt personalize the gift for her granddaughter by suggesting she include the granddaughter’s name in the quilt, like we did in this custom reversible t-shirt quilt we make. She is also going to have a label made out of custom embroidery with her name and date to add to the back of the custom quilt. Even if you are making the quilt for yourself, make sure to add a label with your name and date on it. The information adds value to the quilt and will make it even more special to your family and friends if you give it as a personalized gift. There are many ways to personalize a gift baby quilt. We can add custom embroidery, print off a photo to add and add embroidery to the back side. Another way to personalize this Pastel ABC Baby Quilt is to make a custom gift card. One of our customers took a photo of the baby recipient and made a gift card. This example is a photo of the custom embroidery. Between the two ideas, I like the one about taking a photo of the baby and having the gift card made out of the photo. It would be a lovely way to personalize the the baby quilt, don’t you think? The month after Christmas is a good time to shop for ornaments you want to personalize as gifts. Whether you are buying new ornaments or pre-loved ornaments from thrift shops, look for ornaments that mean something to the recipient that you can easily customize. One of the easiest ways to personalize an ornament is to date it and note why you are giving it with the story on a little added tag. A friend gives her nieces and nephews a dated ornament with a story every year so by the time they are leaving home they have a nice set of Christmas ornaments for their own tree with childhood memories attached. Literally. This particular Christmas ornament was picked up because it was for a fellow ballerina who had a family member dancing in a “Nutcracker” production. 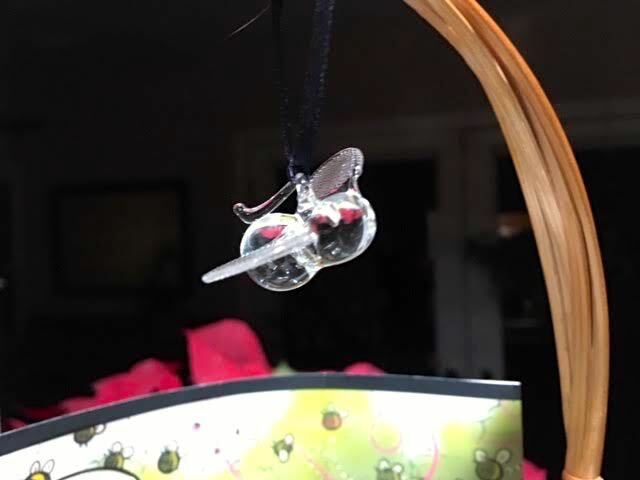 Since the recipient is also a beekeeper, it was pretty easy to personalize this charming Christmas ornament. Do you see it? No one had to date this one to know who was getting it! Another way to easily personalize an ornament is to add a date and the location of where something happened. The location is a good trigger for the memory attached to the ornament. If the ornament like this pink ballerina needs a defining addition, head to your local hobby shop and see if there is a miniature you can add to the ornament. If the ornament marks a special event such as a wedding or anniversary, considering picking up an ornament display hangar so that it can be enjoyed all year around. If giving ornaments every year to family members, it is helpful to keep a list of what ornaments you have given so that you don’t duplicate the memory. Have you ever given Christmas ornaments as personalized gifts? Here’s another way to use the magnetic book mark idea for personalized gifts, especially if you need a last minute gift idea. Print off favorite photos and make them into a magnetic book mark the size of a card that can also be personalized inside. I’m giving family members books this year and printed these photos off their Facebook page. I really like the one of the Beagles fighting over the purple food bowl, it well represents them! I tested the size and these could also make nice Christmas cards. I would add a line on the back explaining what they are and cut them to fit envelopes if you plan to mail them. I also made one for myself from one of my favorite photos of my cat sitting in her window basket. Wouldn’t a whole set of cards that can be used as book marks come in handy? I’m thinking I need of set of cats in different poses. Every time I see this photo it reminds me I need to print off more of the snow scenes to make book mark cards. I have a lovely set of photos from an early snow storm that would be nice to enjoy again and again. For avid readers on your gift list, a box of 8 or 10 different magnet book marks with a favorite saying written or printed inside would make a lovely gift for any occasion. Since making some of these for my own use, I find that I use them quickly and could use more! Of all of the personalized gift suggestions over the years, this is one that continues to surprise people once they give it: the gift of classes. It may not seem like the fanciest present to place under the tree but it can be if you place it inside a fancy box with a big bow. You can also give an item associated with the class and attach the gift certificate that says you are getting this class with the specific date so you need this item. The one caveat is make sure the person getting the class wanted to learn about the particular topic, whether it be photography,, skiing or beekeeping. As the Rolla Bee Club signs up students for the 2019 basic beekeeping classes, we are asking the gift giver if the person has expressed an interest in beekeeping and all have confirmed that has been on their bucket list. If you are not sure where to find classes, check with your local University extension office, many offer a variety of classes during the year. Local vocational technical schools also have adult winter classes for the general public, that is where I have found the photography classes. Recent studies show that learning something new is a confirmed way to keep our brains healthy and growing, which leads to a longer, more fulfilling life. Now that’s a gift everyone should appreciate! There are a number of ways to personalize a gift quilt. The most popular way is to custom embroider a variety of things including someone’s name, special date, a quote or add a photo printed onto fabric. 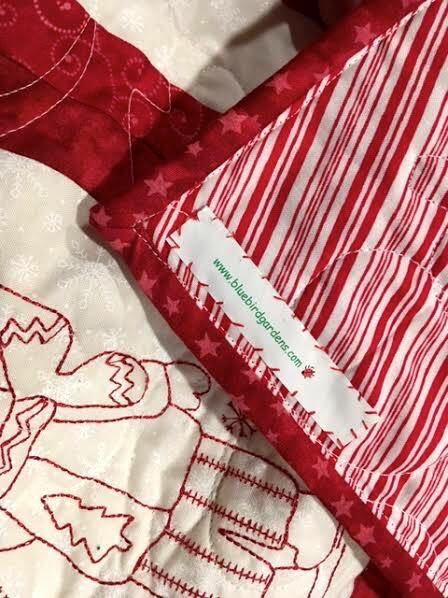 When it is a quilt purchased by someone as a gift, we try to make the gift tag special and in this case, we managed to match the gift tag to the quilt itself. Our gift tag featured red trillium flowers, one of several wildflowers featured in our Cottage Wildflowers quilt. The quilt is being given as a gift to a sister with a lovely dedication in the matching gift tag. They also get a special treat, do you see it packed in with the quilt? 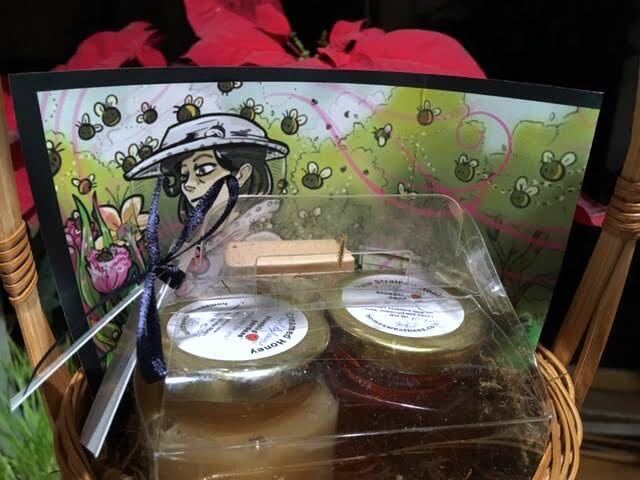 We included one of our honey seed saver packs, wrapped in plastic, as a holiday gift for the buyer. Our honey see saver packs include Bluebird Gardens honey in a plastic container and small wood honey dipper; the blue mesh bag can be used to dry seeds, which then can be stored in the empty plastic container to plant next year. The more plants we have blooming, the healthier our bees will be. We hope both buyer and gift recipient enjoy their gifts! If you’ve look around at your local businesses, and been in business yourself, you know that starting up any business takes a tremendous amount of time and energy, so much so that something as simple as your ribbon-cutting can end up as a torn page out of the newspaper with your full intention of getting it framed to hang on your store wall. That’s why getting the ribbon cutting photo of one of your favorite local businesses is a simple but thoughtful personalized gift. We know how special people think our custom scrapbook quilts are with photos so anything that has someone’s photo can be made into a personalized gift. In this case, it’s a local winery where I get to spend an evening every month or so with friends, enjoying a wonderful meal and learning what wine to pear with different dishes. I added a white piece of paper to the back so we can all write a short personal dedication. Once we all get to sign it, we will personally deliver the photo to the business with our collective thanks for all of the work the owners and staff put into their mostly monthly wine-pairings. Sure it’s what they do as part of their business but having the ribbon-cutting article framed is something they probably haven’t had time to do yet. Other new business owners have shared how much this meant to them so trust me, it’s a great gift idea that will be much appreciated! When you live in a family that has dogs and cats, pet toys are on the gift list. For many years, I have made our family catnip toys with freshly-dried catnip from my garden and inspiration for the design from the garden as well. Last year, my handmade felt catnip toy gifts were butterflies. I was inspired by working on Missouri’s Master Pollinator Steward program, a six-week course designed to help people interested in helping pollinators such as butterflies. To make butterfly catnip toys, the design is simple. The toy needs the wings and a place to add the catnip. Stitch the black portion on three sides and leave one side open to easily stuff the dried catnip. These are so easy to make. Once stuffed, stitch the last side shut. Don’t stuff them too full, you just need enough to give the black center a little pouf or rise. Here they are all finished and ready for a test. My family gift catnip toys are thoroughly tested by my cats. Actually I have to store them in plastic and place them on the top shelf of a cabinet to keep my cats from volunteering to test them. Fun to see the handmade catnip butterfly cat toys unpacked but Bob was not supposed to get all of them! Over the years, we have been honored to ship baby crib quilt gift sets to many granddaughters and grandsons, some who we know still have their quilts because we have also spruced a few up over the years. Although most of our baby crib quilts are custom and unique, we also personalize in a custom unique way. Some people will have us custom embroider just the first name, or the first and middle name. This grandfather chose the later along with the details of the grand arrival: date of birth, weight and height. And to celebrate the grand occasion, I included a little note to proud grandpa. These rag baby crib quilts were made in USA. We still have another pink rag baby crib quilt in stock with green accents. Grandpa wanted one that was all pink so that’s what we selected for him. What wonderful adventures are ahead for both of them! There is a current retail report showing there has been a shift away from E-books back to traditional books. I am not surprised. Even though I love my portable electronic book for traveling, I prefer a book in hand when I’m home, especially ones with lovely illustrations and photographs. Yes, that means gardening books although there are other topics that have similar appeal such as recipe books. If you give books as gifts like the American Encyclopaedia of Cooking, or if you just need a simple thoughtful gift idea, try making handmade book marks. I have made and given them over the years and regardless of what books include them, the thank you notes I have received have been all about the simple handmade book marks that were included. There are a couple of basic handmade book mark designs: the pop up book mark and the one that lies flat on the page. Regardless of the kind you make, you will need one basic ingredient: magnets. You can recycle some of those on your refrigerator as long as you have two that attach to each other or buy a roll of magnet strips that can be easily cut into pieces available at most craft stores. The easiest ones to make are the ones out of existing cards. Pick a card with a lovey sentiment you want to re-read, it’s a great way to repurpose thank you notes. Cut two pieces of magnets. Mine are about half an inch wide. You can cut them larger if you want more attaching power but be careful, if the magnets are too big they will tear the book page. Once cut, remove the paper backing and attach to one side of the card. Add the second magnet piece to the first one; remove the paper backing and fold the card, that will ensure that the magnet pieces meet. I leave the attached magnets in a book as a book mark to allow the glue to dry on the magnets. That’s it. Once the magnets are dry, the card can nicely be used to mark the last page you read or a favorite page you want to read again. You can also make your own cards, then attach the magnets for personalized gifts. As an avid reader, I would love to have a set of these I can easily tuck into my reading pile. These are a great Thanksgiving weekend project for kids of all ages. Kids can cut photos out of magazines, attach printed photos onto card stock and cut out designs from last year’s Christmas cards to make into handmade pop up book marks. The one on the right was made out of a favorite little frog prince magnet. Once the designs are cut, glue the design to folded cardboard card stock so that the card stock fold will wrap around a book page. For the frog prince, I glued the frog so that the tip of his crown sticks up over where the cardboard cart stock folds over. I also left some card stock at the bottom to demonstrate that would be a good place to add someone’s name; there is room inside for writing as well. Once the card stock was cut, I added once piece of the magnet under the top side. After leaving it to dry for a few minutes, I added the second magnet piece to the first one. Remove the protective paper and fold the card back to the original shape so that the magnet strip will glue to the bottom piece. After allowing the magnet glue to dry, here it is, finished and ready for duty. If I wanted less card stock at the bottom, I could have applied the magnet strips to the bottom of the frog. I left the extra white card stock to demonstrate leaving space for adding a favorite saying or dedication. Can you see the possibilities now? Imagine what you can do after printing family photos. Fun to make and even better to give away! Over the years, one of my favorite housewarming and thank you gifts is to give 12x18 inch small garden flags. It’s something people don’t usually think of buying but once they have them, they tell me they enjoy displaying them in their gardens. You can find garden flags and the metal garden flag posts at most garden centers near the arbor displays. The flags themselves may be in another section of the big box garden center and usually are offered by season. The previous season flags may be marked down while the current garden flags are regular-priced. For a first set, pick a garden flag for each of the four main seasons. Garden flags out of season can be purchased online. In terms of options, there are the basic “welcome” and “happy holiday” generic sayings. The garden flags with more unique sayings may be harder to find but I enjoy looking for ones that mean something to me, especially funny and whimsical ones. For gifts, I like to pick ones that have kind and happy thoughts. Garden flags are like lap quilts, they quickly can change the look of garden corner by bringing a touch of the season to that spot. One quick note, the metal garden flag post can be awkward to wrap so find a box to fit them in. Ducky Baby Quilt Almost Didn’t Make It! If you have purchased an item from us, you know we ask you to let me know that it has arrived safely. That’s because one never knows what problems might arise when making a shipment. In the case of this personalized duck baby quilt gift set, the gift-wrapped quilt left Rolla, Missouri safely only to arrive at its destination with an address that did not exist. Luckily the local post office called me to tell me of the issue and I called the customer who purchased the gift set. After checking the address the customer gave us, turns out the address was incorrect but we had a phone number for the gift recipient. I called the postal carrier back, gave her both the new corrected address and phone number and waited. The customer emailed me asking if I had heard anything. Then a wonderful email from the customer saying the baby quilt gift set ended up delivered at the gift recipient’s business office. We figured the postal carrier found her through the phone number because it wasn’t the corrected address I had given her. Regardless, this postal carrier is my new heroine, thank you! Usually this time of year local big box stores will feature something special for pets and I have yet to see something my cats would enjoy more than this piece of homemade cat furniture. If you have furry friends you want to spoil over the holidays, take a look at this piece of homemade cat furniture one of my brothers made. He said he made his first one for his Beagle dogs and figured my cats would enjoy having their very own. At first I didn’t know what it was because he forgot to include instructions in the box. However, after a quick phone call and some quick twisting, the pieces were fitted and the cats had a new perch and napping spot to try. The piece is made out of white PVC pipe with three-way fittings for the corners. Each “floor” is made out of a stitched canvas fabric that slips over the pipes. That’s it. I could glue the pieces together but I didn’t in case I wanted to make new fabric floors. To make the levels comfy, I use old white quilted pillow shams that are easy to wash and replace. In winter, Shirley Honey likes to be surrounded by outdoor pillows that help keep the bottom level warm. This unit sits at a window next to a heat vent. The critical piece to make this is a safe way to cut the plastic pvc pipe. The rest is all about building to size. Here is a closer look at the corner pieces. This one is for the top “shelf. The next or bottom “shelf” is a different joint, it has 4 connectors. Last but not least, the canvas shelf is a simple foldover with stitching in the center. You could make different-colored fabric “shelves” to fit in with your home decor and the seasons. Think you can make one of these for your cats? Looking for a little something to give that office worker, volunteer, mailman to show your appreciation for what they do for you but limited in how much you can spend? Our office Secret Santa used to limit gift values to $10 or less. Our Honey Seed Saver Samplers include four of these blue mesh bags each with Bluebird Gardens wildflowers honey, a small wooden honey dipper and gift tag with instructions for $24.95. Each sampler includes 2.2 oz to 2.3 oz of Bluebird Gardens raw strained honey, just the way bees made it. Bees had to visit more than 250,000 flowers to collect and dehydrate the honey in each of these containers. The 2.2 oz - 2.3 oz is enough for a teaspoon of honey for 6-7 days. Once the honey sampler is empty, it can be washed out and used to store flower seeds dried in the mesh bag for planting next year. I also store dried herbs in some of these versatile plastic containers. Since bees need to visit literally millions of flowers to collect pollen and nectar, these Honey Seed Saver Samplers remind us to keep planting flowers so bees can continue to make honey. Honey is what bees eat while they are wintering over inside their hives and it is a sweetener people enjoy. If you need larger quantities of honey seed saver samplers, just let me know and we can make larger orders. Have you seen those quilted mug rugs that are still popular for beginning quilters to make? They are easy to make and give beginning quilters encouragement to try something bigger, like a table runner. Or place mats. The concept of mug rugs inspired me to make a set for a couple I was working with on an annual conference as a thank you for reaching a planning milestone. Instead of just making the placemat-like quilted piece to hold a mug, I extended the pattern and made a pocket where a napkin could be tucked in. Mirrowing the reason for the gift, I then added a variety of treats to be enjoyed with a mug; stress-reducing tea, calming coffee, hot chocolate, a variety of sweeteners and yes, even a little bottle of whiskey. The long white boxes hold glass stirrers for ice tea. This was an easy way to thank someone for their help and still make it personalized. Check out other personalized gift set ideas for your holiday gift-giving. Our red and blue quilted bags are lined in plastic and come with a free gift tag. 1. They can choose from a quilted, plastic lined gift bag or a vintage lunch box. 2. They can choose what color of Howard Furniture Refinishing color is included. 3. They can write their own special message on the enclosed gift tag. The inside of one of our personalized furniture refinishing gifts, do you see the extra item? This last order included another little surprise. We added a little 2 oz. container of Bluebird Gardens honey with a small wood honey dipper. Seemed only appropriate since Howard furniture care and refinishing products are made with bees wax and carnauba oil. Our little surprise in this furniture refinishing gift, a little honey and honey dipper! If you want to add something personal to your furniture refinishing gift, there's room for a little something. In the past we've added a little wooden toy set, a small tin of fresh catnip and even a box of homemade chocolates. This particular furniture refinishing gift was ordered as a housewarming gift. What other special occasions would you think of giving a furniture refinishing gift?